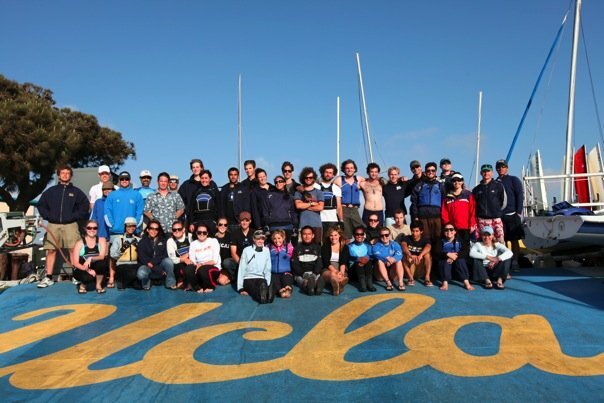 UCLA drove close to 20 hours to compete in an intersectional with the North West division, the people that generally sail in the JV division attended this regatta to field both a Coed and Women’s team. All sailors did very well but both teams were penalized 40 points for not filling out RP forms. Saturday began with a steady 10-15 kts coming from the east. The wind died for 20 minutes early in the afternoon,but resumed the 10-15 kts until eventually stopping at 4pm. Four races in each division were sailed. Sunday began with a light 5-10 kts out of the east, but died to 2-5 kts shortly after A division began their first race. Only one A race was finished and racing was cancelled for the day. Coed was sailed by Oscar Jasklowsi and Tatsuma Woo-Kawaguchi in A division and Drew Morton and Lea Cohen in B division. A division ended up 9th before the RP penalty, 12th after. B division ended up 3rd before the 20 point penalty, 7th after. Overall the Coed team finished 6th before the penalty, 10th after. Women’s was sailed by Shannon Walker and Anna Schoenbrunner in A division and Halie Kampman and Neha Bazaj in B division. A division ended up 14th before the RP penalty, 15th after. B division ended up 8th before the 20 point penalty, 14th after. Overall the Coed team finished 13th before the penalty, 14th after.